A place where the water looks like candy and the sand between your toes makes you smile. 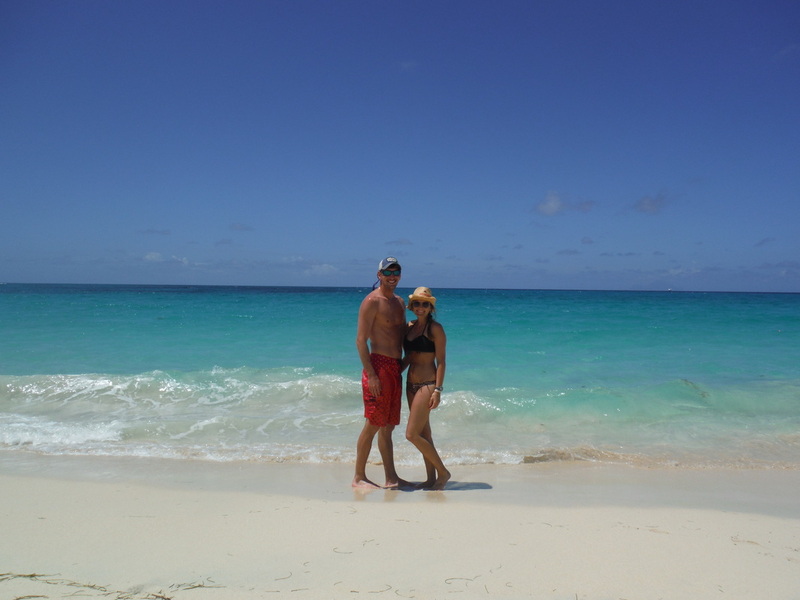 Our trip to St. Martin mainly consisted of laying by the pool or beach but we did do 2 really cool excursions during the week. 1. Captain Alan's Boat Charters. If you google "things to do in St. Martin" this boat charter comes up as the number one thing to do on Trip Advisor. It has 5 stars and me oh my, it totally is a 5 star experience! This was an excellent day trip! We left from the Marina at 9AM and returned by 5, we chose to do the private charter so we could go to a different island. 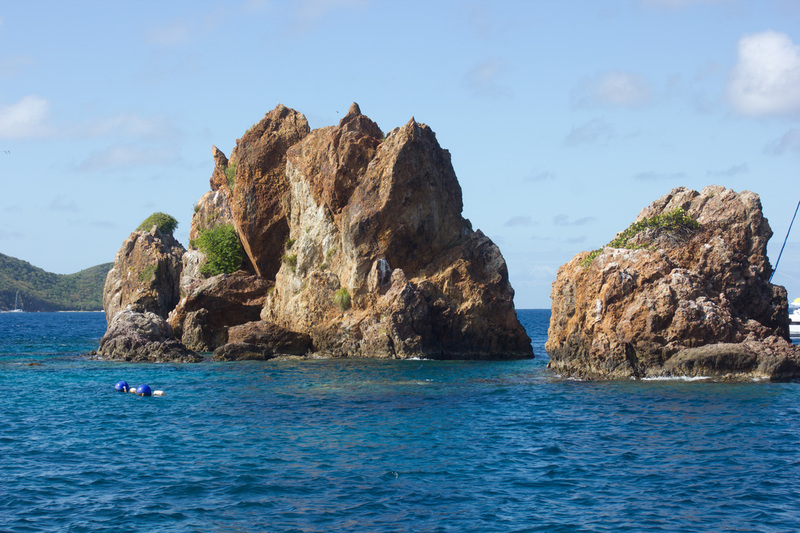 We sailed over to St. Barth's, snorkeled in 2 different places, went to the famous Nikki Beach, and had lunch on the boat. I would recommend Captain Alan's to anyone visiting St. Martin! 2. Loterie Farm: This is an area in the middle of no where on the island. They have a few small cabanas you can stay in but it's mainly for day visitors to come and enjoy. You can eat in the tree tops, take a hike, zip line, lounge by the pool, and do their ropes course. We chose to do the hike to the highest point in St. Martin. Once we got to the top, the view was totally worth it! It took us 1.5 hours and it was a moderate-hard hike, I wouldn't recommend it if you're out of shape. Our friend Abby did it 5 months pregnant though (GO ABBY)! Theron, Andrew, and I then decided to do the "Fly Zone" which is zip lining. We also decided on the extreme zip lining and let me tell you, it was extreme in every sense of the word! It's definitely an adventure that I had fun doing but probably wouldn't do again. It requires physical exertion and it's not for the faint of heart! Andrew even ran into a pack of 6 wild monkeys. Let's just say if this zip lining tour were in the United States, it might not be legal. I don't want to scare you away though, if you're adventurous and not afraid of heights this is something you should totally do if you visit the island just to say you've done it once! The beaches in St. Martin are absolutely beautiful! Most of them will take your breath away upon first look. Each beach has it's own unique thing that it brings to the table so I'm going to tell you where we went and what I liked best about each one. 1. Anse Marcel beach- this beach was on the French side and it was by far the most luxurious. You could rent umbrellas and chairs by the day and just sit and enjoy the blue water, scenery, music, and resort like tendencies. Anse Marcel beach is nestled between 2 all inclusive resorts so there are options for you to eat and drink here if you're into that. We opted to eat at a restaurant at one of the resorts. The restaurant is also called Anse Marcel and it had THE BEST French food! My mouth is watering just thinking about the food at this place. If you want to relax somewhere that they will really take care of you, Anse Marcel is your place. You do have to walk a little bit to get there but it's totally worth it! 2. Simpson Bay- it's on the Dutch side and more in the downtown/touristy area. It was by far the most gorgeous beach we visited. The water was so blue it looked like you could just eat it like candy! There is a small bar there made out of a school bus, that's where you should park and sit. All you have to do is order some type of drink: water, coke, cocktail of the day, you pick and you get free chairs and an umbrella (great deal)! There were several people there but it didn't feel crowded. I also got an aloe Vera massage from a Jamaican lady name Megan here. She's been working the beaches for 7 years and let me tell you, she's worth your time and money. If you go to St. Martin, you must go to Simpson Bay and keep an eye out for Megan! 3. Maho Bay- The only reason you'd go to this beach would be for the Sunset Beach Bar. 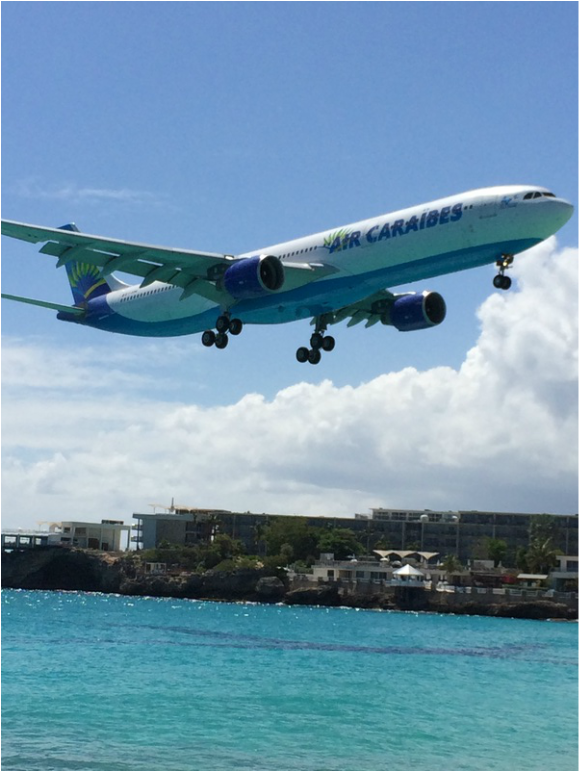 It's a world famous bar that sits a few yards from the St. Martin airport. Famous photographers photograph this beach all of the time because of the planes. The planes fly so low over this beach that it looks like you could touch them. The beach is very crowded but worth the trip to experience the jet blast! 4. Mullet Bay- This was the best beach in St. Martin we found for snorkeling. We saw tons of really cool sea life here. I wouldn't choose this beach if I were just going for a relaxing day as it's not the prettiest (lots of rocks) but it's the best for snorkeling. We saw a barracuda, sucker fish, green moray eel, trumpet fish, and much more! Side note- if you are into snorkeling, I'd highly recommend a charter boat. They can get you to better spots. I'll do a post later on our day on the boat. Lastly, some beaches you don't want to go to include: Fryer's Bay (it smells like the inside of week old trash), Orient Beach (there are a lot of naked people there that shouldn't be naked), and Cupe Coy (it was sketchy and we got back in the car). BVI Trip Day Six... and done. Day 6 was our last full day on the boat. We were so sad for it to be the last day but we still had an absolute blast! This morning we got to wake up to "The Indians." The Indians are rocks that stick up out of the ocean; the people here say they look like an Indian headdress (side note: I don't see it). The snorkeling here was pretty cool but not the best we've seen. Apparently, the diving here is absolutely wonderful, for any of you interested in diving. I did see a puffer fish and an African Pompano fish which were both very neat and rare. Andrew obliged me by kayaking. We've been visiting beaches since we've been together and I always beg him to kayak and he never has done it with me. This time, I asked and he said "sure, when in paradise!" It was amazing, we kayaked to a secluded beach. When we arrived on the beach we realized we weren't stepping on sand but small bits of coral. Luckily, we wore our Chacos so we were good to go. The entire beach was made out of broken shells and coral, it was a site to see! On this last day we also did something that we hadn't done before, we jumped off the top of the catamaran into the ocean. Again, when in paradise!!! When then went over to a harbor in Peter's Island, this was the island that we began our trip with. We did the last snorkel and first of our trip here. I am very sad and disappointed to say that I got out of the water way too soon on this last day! Andrew swam within 5 feet of a sea turtle. I'll post a picture below for proof. 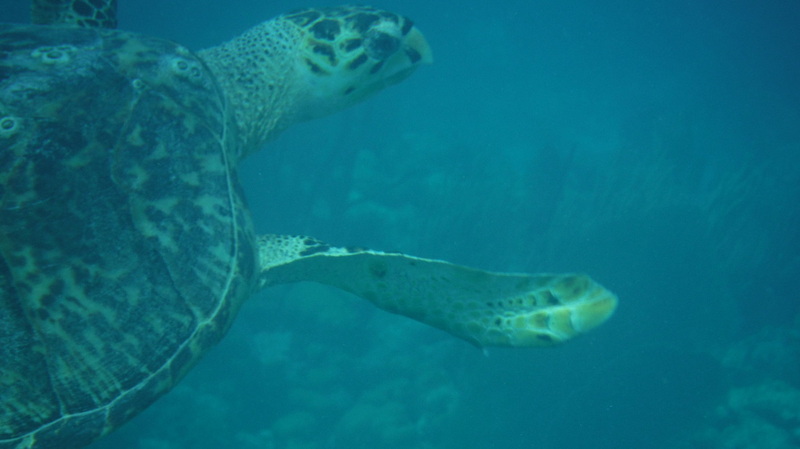 We'd seen sea turtles all week from the boat and Andrew saw one while snorkeling the first day. I would have loved to see this one but it didn't happen for me. 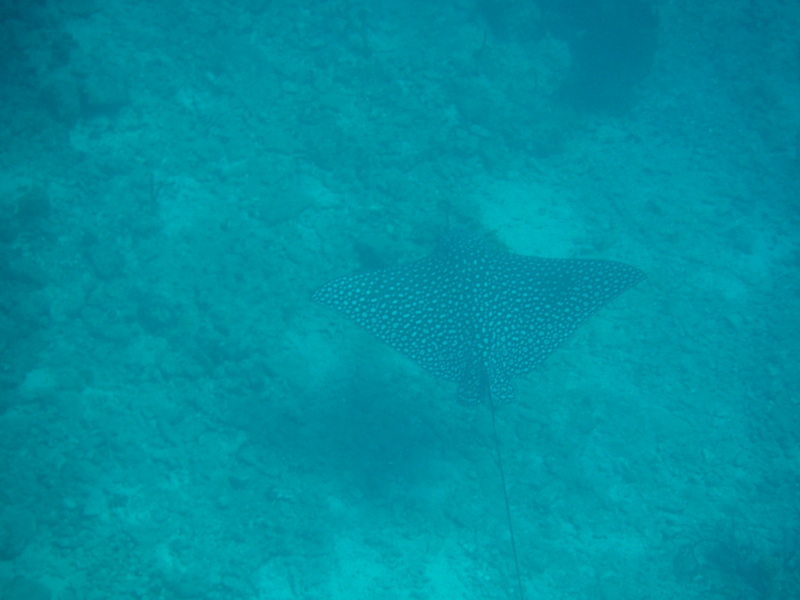 Luckily, I had given Andrew the camera before I swam back to the boat. In closing, this has been the best vacation either of us have ever been on. We spent the 6th night docked at the marina in Tortola since we had to get off the boat after breakfast the next morning. I would highly recommend this vacation! One thing is certain, WE WILL be going back! Day 5 was so much fun (like all the other days)! We got to experience the caves on Norman's island. There are 3 water level caves that we were able to snorkel in. We saw a lot of interesting fish here and it was really neat being in the caves, it felt like a night dive. They say there is hidden Pirate Treasure here but unfortunately I didn't see any. The movie Into the Deep was also filmed here. 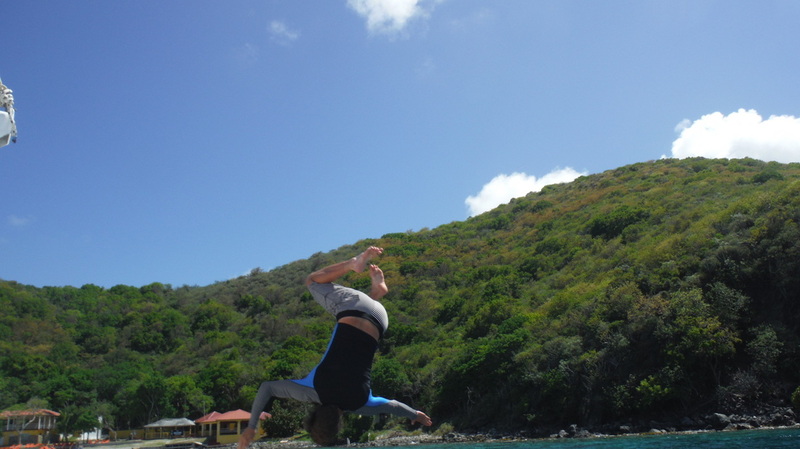 This place is considered the best ship wreck dive in the BVI. Since Andrew nor I dive we didn't experience that part of it but the snorkeling was great so we were happy! Day 4 was by far my favorite day! That morning we got to snorkel Sandy Spit. Sandy spit is a tiny island that doesn't have anything on it except a beautiful beach. They call it this because you can "spit" from one side to the other. It's a private deserted island and it's absolutely wonderful!!!! It has been the best snorkeling so far and the water is absolutely pristine. 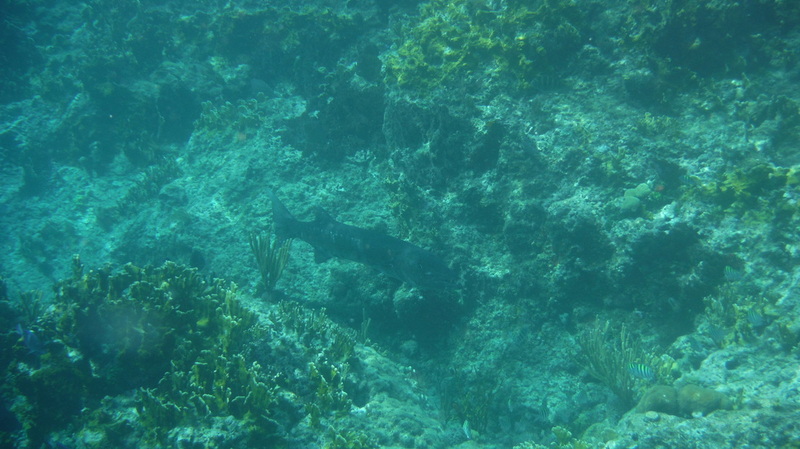 Andrew and I both saw about a 6 foot long nurse shark. I almost peed my pants or well, bathing suit when it cruised by!!! I guess it's good that I was in the ocean and no one would have noticed. Andrew also saw an octopus while snorkeling there. I've added the under water pictures below. After Sandy Spit we then set sail for Little Jost Van Dyke. We did a 15 minute hike to a bubbly pool. We saw lots of wildlife a long the way and the natural pool was pretty neat! The tide wasn't high this day so it wasn't bubbling, it just kind of looked like a small pond (sorry I don't have a picture of this). At the end of the day we ventured to Jost Van Dyke and the famous Soggy Dollar Bar. The bar got it's name because it's only accessible by boat and once you are there your money is soggy from swimming in. I met the owner of the bar while there, he was from Washington, D.C. and had lived on the island for 12 years. There are tons of people from the states down there that have built a life in paradise (jealous!). We had dinner on the boat and then ventured over to Foxy's Taboo where we experienced some awful live karaoke. it was entertaining to say the least. On Day 3 we woke up in Leverick's Bay and got off the boat. On the 3rd day of every Trade Winds cruise the crew changes all the sheets and towels for you so we had to stay on land for a couple of hours. This is the longest that we'd been on land since we boarded the boat. Both of us felt a little "land sick." I didn't realize this was a thing until I experienced it. You feel like you are still on the boat and rocking while you are standing on land, very strange! We shopped a little in Leverick's Bay and relaxed until we were able to board the boat again. After lunch, we ended up in Marina Cay. It is absolutely stunning! We climbed to the top of the hill where they had a resort. The views were breathtaking. There is a famous red phone booth on the dock at Marina Cay. It automatically takes your picture every 15 seconds, you are able to view it on line later if you know the date and time you were there. After a little exploring we went snorkeling. It wasn't the best because the water was really rough but, we had fun anyways! When we woke up the 2nd morning Andrew said, "it feels like you are stepping out of a time machine," and it really does! We woke up to The Baths on Virgin Gorda, it was one of the most beautiful places I have EVER SEEN! We had breakfast on the boat before we set out for our hike through The Baths. Side Note: we were served 3 gourmet meals a day on the boat... it's amazing food! We hiked through the Baths and then hiked up a hill to a resort. The view from the top looked like a fake backdrop, I could not believe my eyes. We saw several lizards and hermit crabs on our hike. Andrew says he saw a snake... normally, I wouldn't believe him but he squealed and ran like a little girl so yeah, he probably saw a snake. When we got back to the beach we decided to snorkel. The Bath's were in my top 3 places for snorkeling on the trip. The coral here was beautiful and the water was crystal clear. After The Baths we sailed to The Bitter End Yacht Club. We got to see something really crazy there, a lady was feeding wild tarpon and these fish were HUGE! We explored Bitter End Yacht Club and then decided to call it a night. We went to bed super early every night on the boat because were so tired from the days activities. We woke up to a beautiful site in the British Virgin Islands on the first morning (the rain was gone, praise God)! We were in Great Harbor Bay on Peter's Island for our first part of the trip. There, we ate breakfast and a few people snorkeled. 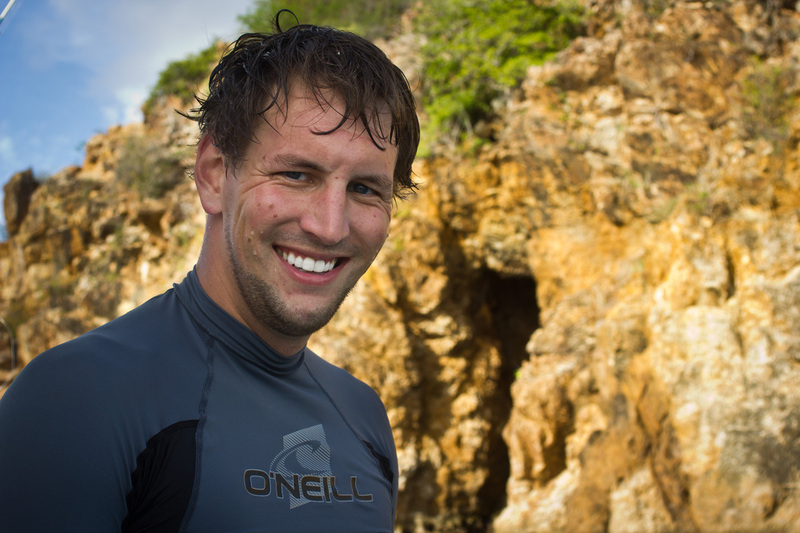 Andrew was one of the folks that snorkeled and he saw lots of fish, a sea turtle, and a sting ray! After a couple of hours in Great Harbor Bay we sailed to Cooper Island. Sailing was so much fun and very relaxing (I took a nap). We ended up in Manschioneel Bay. 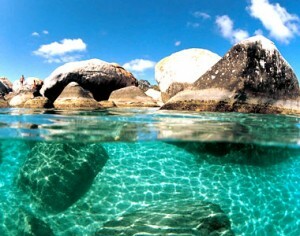 This bay is known to have some of the best snorkeling and man is that the case!! We saw many different kinds of fish; I will list the most interesting: spiked lobster, barracuda, stag horn coral, sea urchins, elk horn coral, parrot fish, squirrel fish, yellow head wrasse, honeycomb cow fish, and much more! Google the fish if you are interested in seeing what all of them look like (worth it). We are getting so close to our trip! I'm all packed and ready to go however, I'm sure this week will be the longest week ever! Andrew made something for you guys that I think you will enjoy. It's a map of where we stop each day. If you are wondering exactly where we are next week, check the map. Day 1 starts on Sunday May 11th. 1. I feel like Day 6, Norman Island will be my favorite. 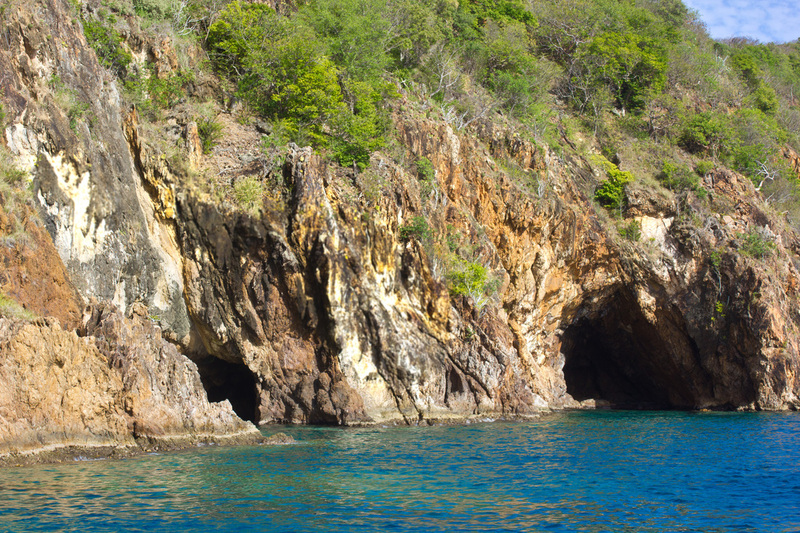 We will have the opportunity to snorkel in three water-level caves, at the base of cliffs. The caves push deep into the cliffs, so that the darkness make the experience like a night dive. Apparently, there is Pirates' treasure stowed in these caves so I'm going to keep my eyes peeled! You can bet your bottom dollar if I find Pirate's treasure I may never come back. 2. Day 2, The Bath's. I don't know why, but I'm excited about the dinghy ride we will have to take from our boat to The Baths. I've never been on a dingy before so I feel like that will be exciting. The Baths are a collection of giant boulders which form pools and grottos. The huge boulders and rocks form a maze that lead to Devil's Bay Beach. Years of natural erosion have created tunnels and caves where we can explore. 3. Day 3, Marina Cay. There are many brightly colored villas and tropical flowers here. It's said to be the most spectacular cay in the region. We will be able to stroll around the Island and enjoy all of the local stores. This evening, dinner is going to be ashore- at the world famous, Pusser's Landing. I will report back after the trip is said and done on my true top 3 favorites, I'll be interested to see if they match up... for now, here are pictures of the 3 things I listed. Andrew and I will be traveling to the British Virgin Islands for our one year anniversary trip! We are beyond excited! 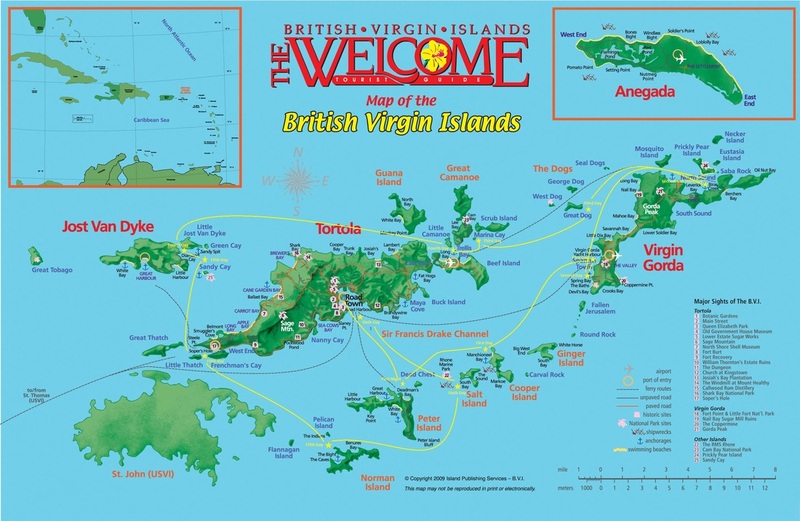 We will be flying into St. Thomas and then catching a ferry to the BVI where we will then sail off on a crewed yacht charter (or catamaran but I like yacht better) for 7 days. The BVI is considered the yachting capital of the Caribbean. We will be 18 degrees north of the equator, if that means anything to you... and have average temperatures of 79-88 degrees so, basically perfect. 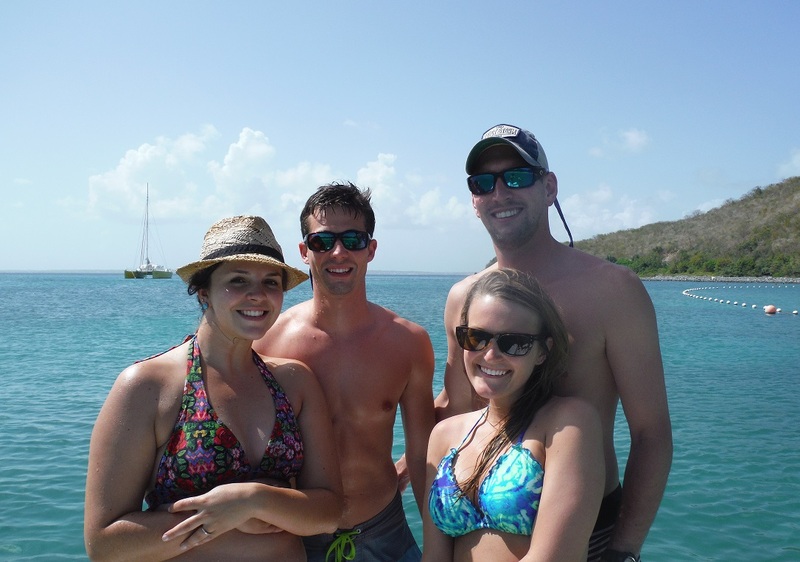 If you want to see our itinerary for the week go here: http://www.trade-winds.com/british-virgin-islands-sailing-vacation.php and no, I'm not TRYING to make you jealous... just stating the facts! Here is a video of what life will be like on board the boat. We will have our own room with a bed, 3 drawers, and a bathroom. It will be very small with only one port hole but I doubt we will be spending much time "down under." This video was posted on YOUTUBE by a lady that took the cruise last year. It gives you a really good idea about how big the boat is and what it will be like. I've already been prescribed the ear nausea patches. I get car sick and I've never been on a cruise before so I'm not sure how my body will handle this. Luckily, I hear the ear patches work really well.... fingers crossed! I will report back after our trip and post my very own boat video or pictures.